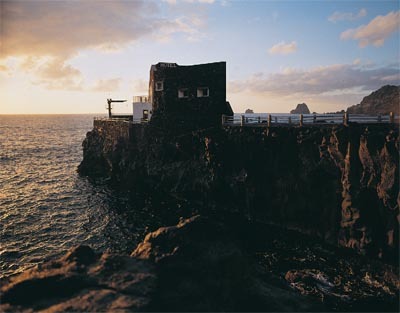 Meet Las Puntas and Hotel Punta Grande in the municipality of La Frontera, El Hierro. Las Puntas is a small yet charming location in El Golfo in the municipality of La Frontera, on the North coast of El Hierro in the Canary Islands. Only a few kilometers away from the Los Roques de Salmor Integral Reserve you’ll find the town of Las Puntas, which has one of the most welcoming corners on the coast of El Golfo. Even though it has only 250 inhabitants, Las Puntas, played an important role to the economy and development of El Golfo after the small pier was built, from where all the agriculture production departed to every point of Europe. Nowadays this pier belongs to the Hotel de Punta Grande, according to the Guiness Book of Records, the smallest hotel in the world. If you take a look from the pier you might enjoy the nice views to the Roques de Salomor and the Tibajate Natural Special Reserve. On the welcoming Punta Grande pier you might jump into the sea and swim for a little bit, a very pleasant experience especially during the summer. Other attractive spot in Las Puntas are the Salt works located on the east side of this pier. It has become a must-see spot for fishermen. Nowadays this saltworks are within the ethnographic heritage. Its believed that these salt works date back to the XVII century. 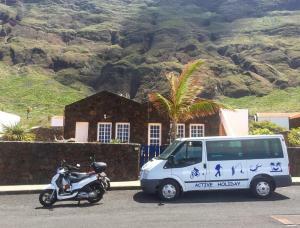 To get to the Las Puntas town it’s advisable to rent a car in El Hierro and head North in La Frontera through the HI-55 and then the road to Calle de las Lajas and Calle de las Puntas.